The method of Induction heating uses electromagnetic energy to heat an electrically conducting material. The electromagnetic field induces Eddy current in the conducting material thereby causing heat through joule heating. The pot used in induction heater is ferromagnetic so that, it heats up by accepting the electromagnetic energy from the induction heater. The heat generating in the pot is then transferred to the water used for cooking. This is why the pot remains cool while its content is hot. But the cooking pot must be ferromagnetic types, one like Iron or Steel .Non ferromagnetic pots made up of aluminium or copper cannot be used in induction heating. 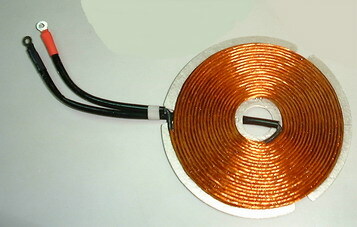 The induction cooker has a large circular coil made up of enameled copper windings placed under the space for the pot. When AC of a particular frequency passes through the coil, an oscillating magnetic field develops which induces electric current into the pot material. When this Eddy current (Not a shocking one) passes through the material of the pot, friction develops in the molecules (don’t be confused, the molecules of the pot material) and heat develops. This heat is transferred to the water to boil the contents in the pot. Efficient induction cooking takes place if steel vessels are used because of its magnetic properties and the steel concentrates all the induced current in the surface so that the heating effect becomes stronger. Aluminum and other non magnetic materials are not good for induction cooking, since the induced magnetic field penetrates deep into the material creating only little resistance. In Coil heater, much of the current is wasted and efficiency reduces to 20-40%.But in Induction heating, energy wastage is very low and efficiency is 80-90%. 4. Only the content of the pot heats. Heat will not pass into the surrounding air. 5. Power usage can be controlled for different types of cooking. This prevents wastage of energy. 6. Cost effective. Electricity consumption is many times lower than the electric heater and cost for electricity is lower than the cost of cooking gas. Let us go inside the Induction heater then we can learn some tips for efficient cooking and precautions of its use.